This entry was posted in Poetry and tagged Animals, Horses, poetry, writing201. Bookmark the permalink. I really like the one word in the eye. Outstanding! Thanks, It is a difficult assignment today. lovely photo – fine poem. That beautiful calm eye reminds me of once we had a feral arabian mare who always had that “wild eye” where the pupil was surrounded by white. We had only one summer with her to try to train her, but everything scared her, especially people and at the end of the summer we had to return her to the seller where she could run freely about her ranch, away from the scary things that surround people. It is funny how different personalities horses can have, maybe it tells us what a good memory and intelligence they have, turning memories into conclusions and preconceptions. Horses do have such beautiful eyes. I like the idea behind your poem; of seeing the world through those eyes and it’s a better place. Nice! Thanks a lot, I appreciate your thoughts. 🙂 Thanks for this kind comment! 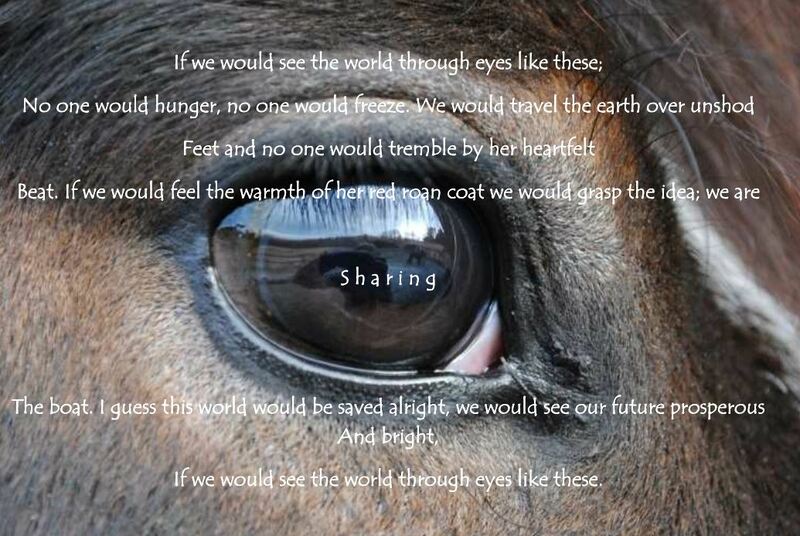 When we see our reflection in the eyes of a horse, we see our truest self.